The concept of archetypal energy is grounded in a depth psychological framework. To tease this apart, the dictionary definition of an archetype is an original pattern or model from which all things of the same kind are copied or on which they are based; a model or first form; a prototype. However, in Jungian psychology, an archetype is a collectively inherited unconscious idea, or pattern of thought which is universally present in individual psyches (Archetype, n.d.). Chalquist (2012) further tied this archetypal energy to the natural world: “Manifestations of human psychic life, including patterns, symbols, and metaphors, link to correlates and correspondences in the natural world across perpetually interactive fields and through complex systems. In other words, geological, geographical, ecological, meteorological, etc. forces are psychological forces too” (p. 3). The place that has been my home and sacred space, and that continues to exert strongly felt archetypal forces, is the American “Heartland” of the Great Plains. For me, this journey of soul engagement specifically began in Kansas where my parents and I were born. Every summer I get invited to our family reunion in Kansas. I rarely go any more, but when I do, I am instantly immersed in the archetypal field of the hardy pioneer, the depression-era family farm, and the Mid-western Main Street. Perhaps this is not any one archetype, but anyone who has spent time in a small Kansas or Nebraska town will tell you that there is a coherence of being that comes into play. Why is this? For one thing, it is a difficult life. The earth is hard and unforgiving. The rain is fickle. The trains no longer stop at the local depots now dry-rotted and busy only with tumbleweeds patrons (Paton, A state of being, 2011). As I alluded to at the outset of this paper, I have recently begun to re-engage my pioneer roots. I may not have my parents much longer and I stand to lose their many stories and connections to the prairie, and my personal, cultural, and historic ties to both land and people, if I do not record their stories soon. In addition, my husband and I are weeks away from buying a home together with my parents on 132 acres of rolling prairie in Eastern Colorado. The intention, moreover, is to start a bison ranch and to be able to eventually fully subsist on the land. Syncronistically, running through these acres, in Elbert County, are the remnants of the “Smoky Hill Trail” that brought the pioneers in the 1850s to 1880s in covered wagons from Eastern Kansas towns to the gold fields of Denver, Colorado and Cherry Creek environs. My current suburban home, southeast of Denver, by Piney Creek, also lies along the Smoky Hill Trail. 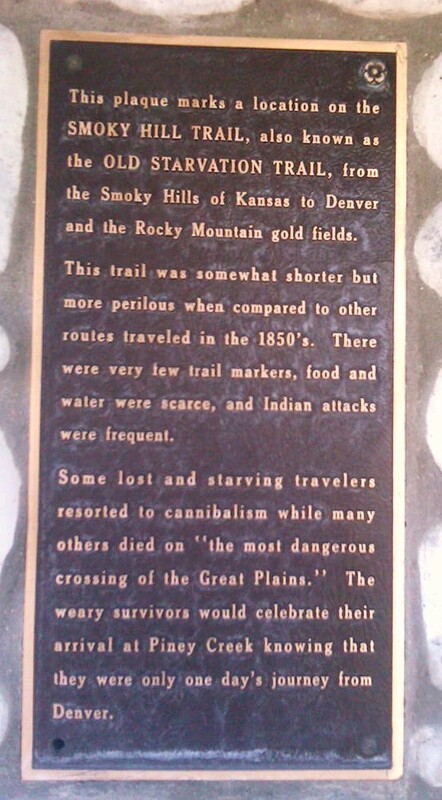 A plaque, commemorating the trail is a five-minute walk from my home (Figure 1). Indeed, our ego and our psyche live in the particulars of history, wind, storms, drought, rain, and dirt. The “Old Starvation Trail” is in many ways representative of my “particular localized form” and engagement of the soul of the Great Plains. It stretches not only through the heart of my connections with the land of Kansas and Colorado, but it is a thread through time connecting the history of the earth, rivers, First Peoples, animals, pioneers, wagons, coaches, railroads, hope, destruction, and finally the modern highway covering over the foot, wagon, and rail tracks. Few who drive by the trail markers are aware of the history buried in layers under their wheels. My own deep desire for engagement with this place, its land, history, and myths moves me to discover how its voice articulates if we pause and sit awhile among the sea of grass. My only memories of Kansas occur in the summer. This is because we drove our motorhome across the country from Maryland to Colorado during my father’s three-week vacations. One would not attempt such a trek during the unpredictable winter months. In one such summer Kansas memory, my older brother, my father, and I sat watching “Lawrence Welk” on television, in the small farmhouse of an uncle. My mother and aunt were in the kitchen preparing supper (dinner, in the mid-west, is the word for lunch). My younger cousins seemed riveted by the show, but my brother rolled his eyes, which meant if he had to listen to one more singing duet with Mr. Welk he might go hang himself in the barn. I was more interested in my father. Every window was open and three floor fans were on full blast, yet my blouse clung to me from the humidity building with the late afternoon heat. My father ignored the television and was intent on looking out the large window. When he got up to smoke his pipe outside, I followed him. I was unprepared for what I saw when I followed his gaze. Even as a meteorologist’s daughter, I had never seen such foreboding black clouds. I have never forgotten it, or the electric feel to the air. According to Heat, (1991) tornado is a Spanish word meaning turned, from a verb meaning to turn, alter, transform, repeat, and to restore. It is the tempest of opposing forces turning in, strengthening, as it gathers dry, cold air and mixes it with moist, warm air. This union of opposites, or alchemy of coniunctio that Edinger (1985) depicted; turns and whirls like star trails circling the poles, transmuting the air and the land wherever the opus, its work, converges to its most powerful culmination (p. 226). It is difficult to imagine how such a destructive work might restore anything, especially as restorative of psyche, unless we consider Jung’s (1971) concept of the inferior-type function. In her 1971, Lectures on Jung’s Typology, von Franz related that the inferior function has immense power due to the oppositional forces of consciousness (represented by the superior function) and the unconscious (represented by the inferior function). Also, according to Jung, (1959) “the inferior function is practically identical with the dark side of the human personality” (CW 9i, Para. 222). One might extend this to imagine the tornado as the shadow side of nature, the destructive energy necessary to balance the creative force. I am especially conscious of the weather, no matter where I live or travel. My father trained as a meteorologist in the U.S. Air Force; at the University of Chicago under Dr. Fujita (designer of the tornado intensity “F-Scale” rating); at the Kansas Severe Storm Center and the National Weather Service in Washington D.C.; finally, he was the “Meteorologist In Charge” of the State of Colorado. Weather is deep in my psyche. Tornadoes especially frequent most of my dreams since tornadoes of every configuration covered my father’s office walls. I am no “storm chaser” but I do get a thrill when the clouds start building. Many afternoons and evenings I sat huddled in a blanket watching the natural fireworks of lighting and my father’s pipe smoke curling around his head. However, it was the sweet rain above all that we honored with unspoken reverence. A smell like no other; like wet jasmine in Maryland, and in Colorado, like parched dirt freshly washed; the scent of fragrant sheets on a clothes line. One aspect of this land and weather that Quantic spoke directly to, and to which Cather alluded, is drought. In the quote above, Alexandra views the land not from its drought aspect, but she sees it in the reverse. It is a land that “swells” and land that “emerged from the waters.” There is moistness in her “love and yearning.” Her eyes “drank” and blinded her with tears. The “great, free spirit” that could blow a drying wind, also “breathes” across the Divide. This is a moist breath as moist as the blood in the “heart of a man or a woman”—as moist as the blood that Alexandra works into the soil with her hands. It is not only the land that can energize the field of a place; a complex can also generate a bundle of psychic energy “organized around a certain theme,” which can be the magnetic pull, the “attractor,” of archetypes on the individual and collective psyche (Conforti, 2003, p. 24). Conforti clarified that complexes act as “antennae” or “tuning mechanisms” for us to connect or not connect with certain archetypes and, specifically, certain traits or “frequencies” of particular archetypes (p. 24). Whitmont (1969) also said that “archetypes manifest indirectly as an archetypal image in a symbol, complex, or symptom” (p. 119). In America, the Great Dust Bowl brought together all the elements of nature, place, history and culture to create such a syndrome of complexes and symptoms that still shape the American psyche. Whether it expresses itself through human art or nature, according to Portmann, “the mandate for virtually all-living systems…is twofold: to insure survival and to express one’s nature” (cited in Conforti, 2003, p. xxv). Indeed, Conforti added, “an a priori field, where form, living in potentia, is converted into matter” (p. xxvi). This “matter” can take many forms, not only in nature, but also in how we view nature and how we find our center, our home within this form. In turn, our imagination originates from this natural home center. And our imagination has Romantic roots. Part of the European Romantic imagination that arrived on the shores of the New World along with the original settlers, as well as later Old World immigrants, was a longing for an “eternal return” to a pastoral lifestyle and ideal. This keenly felt sense of a lost Eden or natural, unspoiled landscape accompanied an escape from crowded, industrial, polluted European cities. When America’s dense virginal forests, teeming wild life, wide open frontiers, and abundant natural resources were first learned of, it quickly translated into manifest destiny, the Homestead Act, the transcontinental railroad, the gold rush, and the primacy of progress (Marx, 1964). In their earnest desire to create a garden for themselves and their children, the settlers soon recreated cities, decimated indigenous peoples and species, and created vast dust bowls of over-cultivated topsoil. This Edenic, pastoral archetypal ideal that we still persist in claiming as our birthright as Americans, continues to shape our cultural selective memory and therefore shapes our actions still. For example, instead of thinking logically of how to create dense population centers with minimal ecological impact, our longing for nature causes us to spread out our population centers, resulting in urban sprawl. By each of us desiring our little parcel of land, we have created thousands of suburbias with patches of thirsty lawns that require water and fertilizers in desert or semi-arid environments (Pollan, 1990). We have selective memory when it comes to soothing the wound of our industrial complex. In our effort to each grasp our own piece of nature, the collective; the land held in common is destroyed or altered, which recreates the wound in a vicious circle. Yes, our appreciation, our love of nature, or the cultivation of the love of nature may contribute to preserving it, but if our complex surrounding the pastoral archetype goes unrecognized, our love becomes smothering, consuming, and leads to a loss of the very thing so earnestly desired. At the turn of the 19th century, the millions of virgin acres of the United States’ Southern Plains called to pioneers. The black topsoil, rich as chocolate from long rain cycles, soon yielded record crops. The newly built railroads brought more farmers, eastern farming practices and soon wheat speculators. The horse and plow that plowed a mere three acres a day were replaced with tractors that could turn over fifty acres. Father and son took turns running the new shining green John Deeres night and day. Then, in the summer of 1931, the rains stopped. The drought continued for a decade. It took 1,000 years to make one inch of topsoil; in a few minutes of a dust storm, it was gone. The massively tall and wide black whirlwinds blotted out all light. For many, it appeared to be the end of the world (Worster, 2004). It should be remembered that the word “soil” is also “humus,” from which, etymologically, we also derive “humility” (Chevalier, 1996, p. 331). Jung (2002) also spoke to the hubris of ignoring the intrinsic qualities of the earth: “The facts of nature cannot in the long run be violated. Penetrating and seeping through everything like water, they will undermine any system that fails to take account of them, and sooner or later they will bring about its downfall” (p. 128). Even as the dust storms and some of the hottest summers on record persisted, farmers continued to plow, believing that the rains would return and that the earth would still serve up its bounty once more. Many would internalize the outer event of the “Dust Bowl.” The colossal clouds of darkness, mountains of dirt, ruined crops, constant grit in their food and teeth, choking and claustrophobia represented Western Kansas, the Depression and their childhood (my mother for one). This became their lens on the world; a world of constant worry, fear, hunger and lack. In turn, the following generation was molded by parents always preparing for the worst-case scenario, with the dust cloud always lurking on the horizon (Paton, Black blizzards, 2011). In alchemical terms, drought and dryness are associated with fire and the process of calcinatio. Edinger (1985) spoke of calcinatio as a drying-out process. “The necessary frustration of desirousness or concupiscence” is also a feature of this alchemical stage (p. 42). The dust bowl certainty frustrated many farmers and perhaps some in hindsight were able to “see the archetypal aspect of existence” (p. 44). According to an early edition of Webster’s Unabridged Dictionary, the word ‘Kansas’ in the Indian vernacular means “Smoky Water.” This reference applies particularly to the stream commonly known as the Smoky Hill…. The Smoky Hill river is shown on early maps as the River of the Padoucas, from the fact that the stream has its source in territory occupied for ages by the Comanche Indians, or, as they were first known, Padoucas. A few blocks from my home is a wondrous sight of equal opportunity for the dead—and the un-dead. A Bed Bath and Beyond, a TGIF Fridays, a Chick-fil-A restaurant, a four-lane highway, and of course in the middle of all, a 120-year-old pioneer cemetery enclosed with iron fencing and a five-pound padlock. I think the cemetery was there first. There are little clues to this fifty-by-fifty-square-yard plot of silent history. The modern sign emblazoned atop the fencing proclaims it as the “Melvin-Lewis Cemetery.” The prairie grass grows tall, it is impossible to see if any headstones remain. A new commemorative marker lies a few feet in from the fence, but the padlock makes it impossible to read without binoculars. “The living” drive by this peculiar shopping center attraction without a glance. It does not have a drive-through or double espressos. It does have the Colorado State Anatomical Board’s registered remains of the 1,662 cremated souls who gave their earthly bodies to medical research. Many years after a few unregistered pioneers of the Pike’s Peak gold rush made the ground their final home, the University of Colorado and Health Sciences Center bought the land and decided it was a nice spot for a few more bodies (Crowle, 2004). The pioneers, Melvin and Lewis, who gave their name to the cemetery, also created the small community of Melvin, Colorado. The cemetery overlooked Melvin until the houses and buildings were condemned and submerged under Cherry Creek Reservoir, created by damming Cherry Creek in 1950. Melvin or Melvin City, as it was also known, began as “12-Mile House” (Piney Creek History, 2012). From the 1850s to the 1880s, entrepreneurial ranchers and farmers erected stagecoach stops along the Butterfield Overland Dispatch, which followed the Smoky Hill Trail, about every four miles along Cherry Creek, from the present day Parker, Colorado to the terminus of the Smoky Hill Trail in Denver. The owners of the “mile houses,” like John Melvin, provided fresh mules or horse teams, meals, lodging, and goods to weary gold seekers who had made the dangerous trek from Leavenworth, Kansas and other locales of eastern civil society (Lee, 1980). If they survived the frequent Indian attacks, broken wagons, starvation, or cannibalism of the “Starvation Trail,” they could enjoy the region’s then-largest hotel, which John and his wife Jane built at Melvin. After the hotel, John and others added a tavern, post office, and a half-mile racetrack, all now tranquilly rotting under the water of Cherry Creek Reservoir. I know that some parts of Melvin still linger by the ancient cottonwoods that have survived the years and water invasion. As I walk the trails around the reservoir, now a State Park, I wander off the worn path and seek out the shade where I know John and Jane once sat. A few broken stone foundations speak from the dirt far from anyone’s notice except those seeking wagon wheel ruts and shadows. Grass is the most widely distributed of all vegetable beings and is at once the type of our life and the emblem of our mortality…the carpet of the infant becomes the blanket of the dead. Although there has been a successful effort in Kansas to mark the Smoky Hill Trail and the Butterfield Overland Dispatch, this has not been the case in Colorado. Little remains of the trail except for a few plaques, a road called “Smoky Hill Road,” and the name of a high school (which my children attended). I would venture that most residents near the road or high school have no knowledge of the Smoky Hill River (which originates much further east) or the long history of its namesake’s trail. Edinger (1985) also related that, like the open plains, “the prima materia is undifferentiated, without definite boundaries, limits, or form. This corresponds to a certain experience of the unconscious that exposes the ego to the infinite, the apeiron” (p. 12). When my parents are gone, I know I may be one of the last generation to feel “part of the prairie” and it part of me. Still, I am bringing my children out to the Eastern Colorado plains soon. We hope to bring some buffalo back to the land; we hope to see the stars. I hope we can, for a time, sit out on the back porch, with my father, and watch the billowing sky signs. Perhaps I will one day hold a grandbaby on my hip and tell them about the nearby pioneer trail. We can get down on our hands and knees to feel the native grasses that have tough roots that grow deep into the heart of the land. Cather, W. (1999). Novels & Stories, 1905-1918. New York: College Editions. Chalquist, C., & Gomes, M. E. (2007). Terrapsychology: Re-engaging the Soul of Place. New Orleans: Spring Journal Books. Chevalier, J., & Gheerbrant, A. (1996). The Penguin Dictionary of Symbols. London: Penguin. Conforti, M. (2003). Field, Form and Fate. New Orleans, LA: Spring Journal Books. Edinger, E. F. (1985). Anatomy of the Psyche: Alchemical Symbolism in Psychotherapy. La Salle, Ill: Open Court. Ehrlich, G. (2002). “Landscape”. In L. Anderson, & T.S. Edwards, At Home on This Earth: Two Centuries of U.S. Women’s Nature Writing (p. 307). Hanover, NH: University Press of New England. Heat, M. W. L. (1991). PrairyErth: (A Deep Map). Boston: Houghton Mifflin. Hillman, J. (1983). Archetypal Psychology: A Brief Account. Dallas: Spring Publications. Jones, S. R. (2006). The Last Prairie: A Sandhills Journal. Lincoln: University of Nebraska Press. Jung, C. G. (1971). “A Psychological Theory of Types” (R.F.C. Hull, Trans.). In H. Read et al. (Series Eds. ), The Collected Works of C.G. Jung (Vol. 6). Princeton, NJ: Princeton University Press. _____., & Hull, R. F. C. (1959). Collected Works of C.G. Jung/ [Vol. 9, part 1] The Archetypes and the Collective Unconscious. New York, N.Y: Pantheon Books. _____., & Sabini, M. (2002). The Earth Has a Soul: The Nature Writings of C.G. Jung. Berkeley, Calif: North Atlantic Books. Lee, W. C., & Raynesford, H. C. (1980). Trails of the Smoky Hill: From Coronado to the Cow Towns. Caldwell, Idaho: Caxton Printers. Marx, L. (1964). The Machine in the Garden: Technology and the Pastoral Ideal in America. New York: Oxford University Press. Paton, C. (2011, May 16). A State of Being. Retrieved June 3, 2011, from Pacifica Graduate Institute Course DJA 800 DesireToLearn site. _____. (2011, January 17). Black Blizzards. Retrieved June 4, 2011, from Pacifica Graduate Institute Course DJA 720 DesireToLearn site. Pollan, M. (1990). Why mow? The case against lawns. In S. H. Slovic, & T. F. Dixon, Being in the world: An Environmental Reader for Writers (pp. 433-443). New York, New York: Macmillan Publishing Company. Quantic, D. D. (1997). The Nature of the Place: A Study of Great Plains Fiction. Lincoln: University of Nebraska Press. von Franz, M. L. & Hillman, J. (1971). Lectures on Jung’s Typology. Dallas, TX: Spring Publications. Whitmont, E. C., & C.G. Jung Foundation for Analytical Psychology. (1969). The Symbolic Quest: Basic Concepts of Analytical Psychology. New York: Published by Putnam for the C.G. Jung Foundation for Analytical Psychology. Worster, D. (2004). Dust Bowl: The Southern Plains in the 1930s. Oxford: Oxford University Press. Carla Paton is a Ph.D. student in the Depth Psychology program with an Emphasis in Jungian and Archetypal Studies at Pacifica Graduate Institute. She resides in Colorado and is a database administrator with 20 years of corporate experience. Her interests include using image in the creative process, the archetype of place, the dark goddess, cyborgs, and the intersection of the feminine and technology.